dotCMS is open source CMS (Content Management System) Web Application written in JAVA . They have published on their page "Known Issues"  to share information about some vulnerabilities. This kind of initiative is really good, but in my opinion, they are doing it in selective way - based on my own experience, they share information partially. letter, sent on 2014-09-16, contained 5 different vulnerabilities (3x XSS, Direct Object Reference, Session fixation). They published only one of them and (in my opinion) the most less critical one - XSS on "page not found .jsp" . It was published on 2014-09-23, so it didn't take too much time to fix it. But I didn't get any feedback from them about fixing it, I figured it out because I have my name in "Google Alerts". letter, sent on 2015-12-07, contained information about current Full Disclosure (email header injection, XSS in HTML emails, possibility to re-use CAPTCHA code). No direct feedback. No published vulnerabilities. I asked feedback in next letter and then I got it. letter, sent on 2015-12-14, contained information about 8 SQL injection vulnerabilities. Finally got some feedback. Detailed timeline is described later. There is no pre-condition on authentication or on authorization to access this functionality. All you need to know is that this functionality exists and the parameter names there. If you can access one installation of dotCMS, then it's easy to detect those. And this one installation can be dotCMS own demo site, demo2.dotcms.com. captcha="hwxc5" # captcha value in case "useCaptcha" is true. Seems like a problem? It's not. It's possible to re-use one correct captcha value endless amount of times. ... and I got mail! It's a bit bad already, because site does not have any input validation check - attacker can use whatever value for "from email address". In other words, attacker can send emails as whoever on trusted SMTP server. That may result in misusage of server (for example attacket can send viruses) and trusted SMTP server end up in some blacklist. Visually everything seems ok (image above). From received email source (code below) we can see subject parameter value is just "subject" and my extra header (X-PoC-of-New-Line: True) is on new line. It means - vulnerability! attachment - extra attached file to prove that it's possible to send files using this security hole. All line-breaks in given value must be "\r\n". In POST request those line-breaks are presented in URL encoding %0D%0A. From received email it's visible, that creating multipart email was successful and extra file is attached. 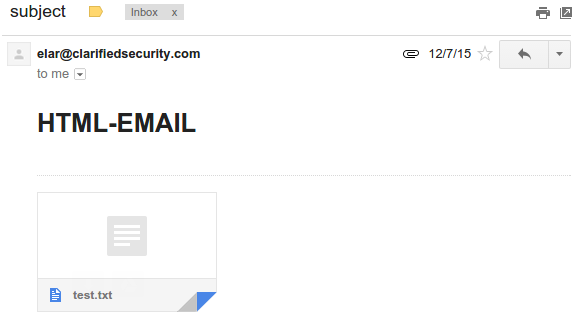 We can see, that attacker can fully control the content for that email. ... some headers removed ..
2016-05-10 | dotCMS > me | email header injection is fixed in versions 3.5 and 3.3.2. They fixed the security hole (commited the fix) few hours after my email on 2016-04-07. Before that, they just ignored it 5 months, even though they declared "security is something we take seriously"
First suggestion is to be up-to-date with your dotCMS framework. But this is fix for only one of listed problems. In general, to avoid "email header injection", it should not be possible to use new lines in email header userinput. Typically those fields are: From, To and Subject. The problem with dotCMS framework sendEmail functionality is that it is a library or API, but not a controller. You need to build controller for every form and submit your email forms to your controller, not directly to "sendEmail" path. Disallow requests to sendEmail path. SecurityFocus: "dotCMS CVE-2016-4803 Email Header Injection Vulnerability"
FullDisclosure: "CVE-2016-4803 dotCMS - Email Header Injection"
VulDB: "dotCMS up to 3.3.1 subject CRLF privilege escalation"